Folks, the beat goes on in this impressive pattern that keeps on delivering storm systems across our Sub. Will some folks score more Spring snow and surpass 50"?? Clinch 1st place??? It'll take a lot more for Chicago to join the bunch but the signals are there that measurable snowfall later this this weekend are in the cards and may cause the MLB to cancel the Cub's game on Sunday. The 00z Euro has trended towards the other models and has shifted the heaviest snow band SE across portions of E IA/N IL/NE MO/WI. The NAM models paint a similar picture as well. Besides the snow, lot's of precip being depicted and we can't forget about the Severe Wx potential down in the deep South. Looks like a narrow band. Tom you may score nicely with this one! one to my north and one to my south. got my fert down on Tues and top dressed with some extra seed. A couple more inches on top would work for me! NAM getting kind of beefy with snow totals but it would be fantastic to get a few inches of April snow. 12z NAM with a shift further NW. Fairly similar to the Euro, which finally caved to the SE. Still enough time for this to shift either way another 50-100 miles for sure. This will be such a narrow band. Hard to believe these amounts with much of this daytime snow with marginal temps, but seeing some flakes would be kind of cool. Missing the bulk of the A-team posters, this thd won't see the traffic other systems have produced. Attm, looking like best (worst?) scenario is a 2-4" Kuchera hit which due to mid-April would be more like a 1-2" deal, aka where mby's spent most of the winter, lol. For now, GRR likes Rain/Snow down my way. 12z Euro more bullish with the snow around here...it would be pretty neat to see one more decent snow this season. I wonder why the euro spent three days showing a wrong nw track. Just been lurking lately as I thought winter was over...well it's been over for Chicago folks for sometime now. Hard to believe that the models are showing these amounts but it looks like we will get a couple inches at least on Sunday. Good day to spread some seeds on the lawn tomorrow as the snow would really help with the spring growth. Travel day Saturday so I might try to sneak that in b4 dark..
RGEM @h40-42 looks pretty ominous. Feels strange after all this time to be tracking a potential winter hit. This is disappointing. My snowfall total for this winter was 50.8". I was hoping to add to that, and it's funny how the last storm had all the snow to the north and now this one will be to the east?? Still hoping for a last minute shift west. It still seems like there will be a Palm Sunday snow event across the area as you head out to Church Sun morning. I don't think I've ever experienced a snow system on Palm Sunday so that'll check off the bucket list I guess. 2-4 on grassy surfaces. Temps stay above Freezing. Is there anything more annoying? Several 60’s showing up in the 10 day. Nuisance storm. Good day to watch the Masters tomorrow and clean the house. If the forecasted 2-4 inches of snow fall happens then there could be a new record snow fall for April 14th in west Michigan. Here are the record snow falls for April 14th At Grand Rapids the record is 1.6” in 2014 with 1.4” in 1939 in 2nd place and 0.5” in 1905 in 3rd place. At Lansing the record is 1.5” in 1939 with 1.0” in 1892 in 2nd place and for Muskegon the record is 2.0” in 1905 and in 2nd place is 1.6” in 2014. Of note of the above years 1905 and 2014 had very cool summers. If that 2/4 happens it would be a record for the date for most of west and central Michigan. Which speaks to two points. 1) Our spring snow climo is really lame by mid-April. 2) As he posted, gimme real winter or real spring-not this! Lol @ the 1-1.5" line literally bisecting mby here in Marshall. If nothing else, this pattern's been "set your clocks" consistent. Looking forward to those 60's he mentioned as well. Unless I were to get in on some really good stuff, I’m glad I’m missing out on this one. A 3-6” event wouldn’t do much for me this time of year except cause a big mess. Gone the next day. No thanks. It was such an average winter here. Stat padding would have nice in early March lol. Perfect system for Michigan. Wish it was January. One of the best snows of the year. Ripping here. Well over an icy already. Puking half dollar size flakes with a howling NE wind. Everything is getting plastered. Pretty wild stuff for mid April. Skies have gotten darker...easily 1/4 mi viz...one of the most intense snow fall rates of the year. Impressive deformation zone right over the area. #PalmSunday #Snowstorm...one of the best April snowstorms I have ever witnessed...it's just non stop heavy snow and wind right now! Current conditions at Chicago, Chicago-O'Hare International Airport (KORD) Lat: 41.98°NLon: 87.9°WElev: 666ft. 2.8” and counting...surprised to see how quickly it’s accumulating. Very wet, dense snow that’s sticking to everything. It would have been nice to see this here, although I also don't mind getting missed this late in the season. Is it sticking to the pavement or just the grass? Just started here maybe half an hour ago or so. So far melting on contact. DVN was calling for 1-2" in the heavy band. I knew that was too low. Nice way to end the season, Tom. Congrats! And the best part is that it’ll all be gone in a few days. Looks like we are in the sweet spot/pivot point. I could see 4 inches here in Grand Haven. Not sure how much snow as fallen the temperature is still at 33.4° (more has fallen then has accumulated) but here at my house there is now a solid one inch of snow cover. It is now on the grass, roofs, trees and now even on the road and sidewalk. With today's snow fall Grand Rapids will go above average for the month of April. 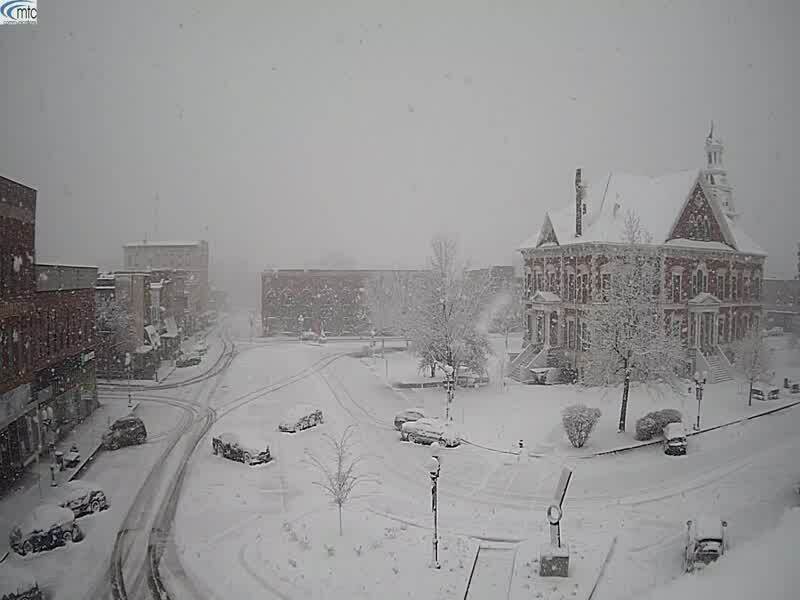 Today may set a new record for snow fall for April 14th (1.6" is the record for today) and for the 2018/19 season we will have to see just how close Grand Rapids gets to 80.0" As before today's snow it was at 77.1"
Exactly! No need to shovel this heavy stuff. I'm enjoying the view from inside while cooking up a big pot of soup. I'm not kidding, you could fool me and say its early Winter out there. Snow blowing sideways, at times, almost whiteout conditions. I'm at 3.2" but I think we'll fall short of the 5.4" needed to tie the all-time record for greatest April 14th or later snowstorm. Really intense rates right now. I'm at 4.5" and this stuff is easily 1"+/hr rates...I think we have a shot at breaking the record at ORD today. What a treat this storm has been. Edit: Makes up for all the misses this season as I've seen +SN, Thundersnow, Blowing Snow, near whiteout conditions...pretty much sums up today. I now have 2.5" of snow on the ground here at my house the temperature is still at 33 so this is a very wet snow to say the least. Still getting moderate to almost heavy snow fall at this time. This is a lot of snow to fall during the day in mid April. And it is still very windy as well. Heaviest snow I’ve seen all year without a doubt! Just won't quit here. Pivoting over us still. This is nuts. Reading the NWS headlines this morning, I could never have imagined it would end up like this. I’m sure LOT is surprised how this storm has performed.